Tea Tree essential oil’s spicy, medicinal aroma purifies, clarifies and protects the body, mind and spirit. 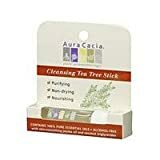 Aura Cacia Cleansing Tea Tree Stick combines the therapeutic power of tea tree with skin-nourishing jojoba oil and coconut oil triglycerides. The result is a gentle and effective aromatherapy application that goes beyond harsh, alcohol-based roll-ons. It’s natural therapy you can take anywhere!